Condo, Studio, 1 Bad, (Schlafmöglichkeiten 2-4) am besten für eine Single, oder ein Paar. Wir sind strategisch direkt über die Straße von der größten Supermarkt der Whistler, Drogerie, Spirituosengeschäft, Starbucks, etc. und zu Beginn des Whistler Fußgängerzone von Geschäften, Restaurants, Bars, etc. entfernt Die Skilifte sind etwa 15 Minuten zu Fuß oder Sie den kostenlosen Shuttle-Bus nehmen. Dieses geräumige Studio-Wohnung ist größer als die meisten. Es hat einen eigenen Eingang und eine sichere Tiefgarage, ist geschmackvoll eingerichtet, mit einem gemütlichen Kamin. Das Studio Suite verfügt über ein Queensize-Bett und ein Schlafsofa (Queensize). Einen Whirlpool im Freien zur Verfügung für alle Gäste. Dies ist ein Nichtraucher-Keine Tiere suite. Wir haben zu sichern beheizte Tiefgarage kostenlos! Nice, roomy studio located on shuttle bus line and steps from Market Place was comfortable and convenient. While we did have some issues with the oven, the Owner was responsive and got issue resolved. I would have liked a few of the basic cooking essentials like oil, salt, and pepper and a stereo that I could connect to my phone (forgot my briefcase of cassettes :-) but probably being a bit picky. Probably about 3 minute walk to bus stop and then another 5 minutes to Whistler Village so it was quite convenient for our ski holiday. This Condo is in a great location however we were not there to ski, but was easy to walk around everywhere. Very clean cozy and comfortable come I would definitely stay here again. The owner is also great to work with and anytime I contacted he was very responsive. I’m glad you enjoyed your stay.Please come back and visit again soon. This studio worked nicely for our family. We appreciated free underground parking and having a ground floor unit. 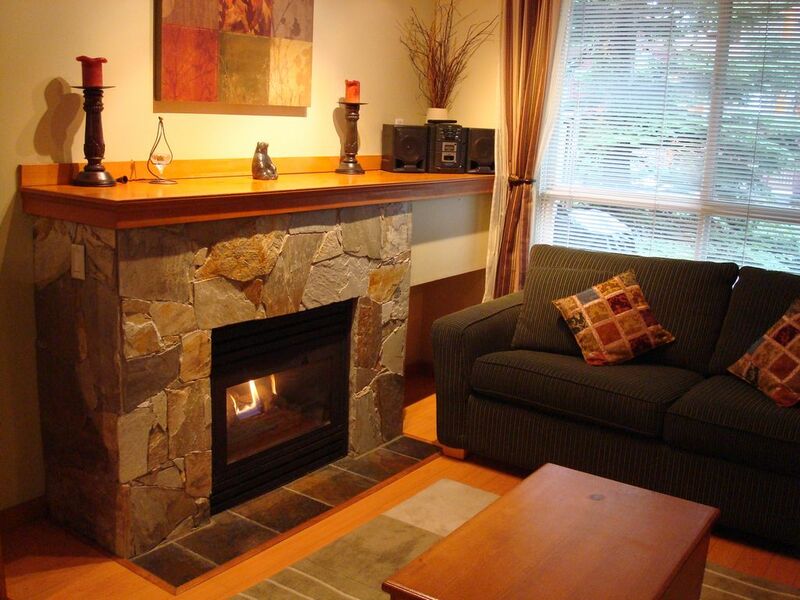 The decor was cozy and the gas fire place excellent. The deep soaking tub was nice in the bathroom. Everything was pretty clean (there were a few dishes put back dirty and old water in the coffe pot but these were small oversights) and well maintained. We would definitely stay here again and recommend it to others. FYI if your a adrenaline junkie Whistler Bungee is a must. The zip lining is pretty cool as well. Also if your looking to save a little money on groceries and have a car rental there is a Super Walmart in Squamish which is about 35-40 minutes before you hit Whistler as the local grocery store can be a bit high on certain items. Great location. Cozy and comfortable studio. walking distance to everything. Had a great stay. I was very happy with this place. The purpose of my visit was to experience snowboarding one of the largest mountains in North America. The unit was very clean and was conveniently located close to the Olympic village where all the restaurants and shops were located. There is a free shuttle to the gondolas really close to the unit which is nice. Dean provided clear instructions for everything we needed --- pretty much self explanatory. Would definitely stay here again. Das Hotel liegt auf dem Talweg, über die Straße von Whistler Market Place. If cancelled outside of 45 days prior to check in 90% will be refunded. If cancelled within 45 days prior to no refund is given. Must be 23 years or older to rent my condo. No Pets or Smoking.